This is a fantastic time of year to get the jam pans out as there is so much amazing soft fruit around. With raspberries you have the added bonus of having the autumn varieties as well which means you should never be without some delicious jam to go on your toast in the morning. 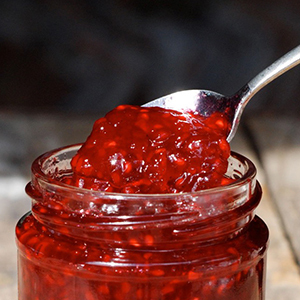 Try this brilliant recipe from our preserves tutor Vivien Lloyd. She has lots of other fabulous recipes on here website – take a look here. 1.Place the raspberries in a large pan. Gently simmer the fruit for about 5-10 minutes. Meanwhile warm the sugar in a low oven, 140C/275F/Gas 1. 2. Remove the sugar from the oven and place the jars in the oven. Add the sugar to the pan and stir until it has dissolved. Bring the jam to a rolling boil and boil hard until setting point is reached. 3. Test for a set after 4 minutes using the flake, cold plate or thermometer test. As soon as setting point is reached, remove the pan from the heat and leave it to stand for a few minutes. Push any scum from the surface of the pan to the side and remove it with a metal spoon. 4. Gently stir the jam and pour it into clean warm jars, up to the brim. Seal the jars immediately with new twist top lids. Leave the jars upright and undisturbed until cold.